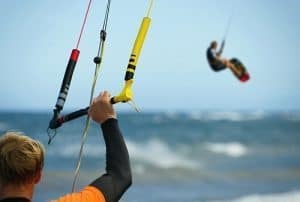 Throughout the summer we run specific kite surf weeks at our Lixouri Bay Beach club. Enjoy a week of sunshine and wind in Kefalonia with kite instruction, inclusive water sports and a friendly group vibe. If you can already kite and have your own kit please feel free to bring it along if you are considering a standard Beach Club Holiday. With cross/offshore winds and a gently shelving big sandy beach, Lixouri Bay is a good spot to kite. It’s not a busy beach either so works really well for launching and kiting. We’ll also provide on the water safety cover for your peace of mind free of charge. The island of Kefalonia is a well-kept secret lying off the South-West coast of mainland Greece, well known for its mountain range, perfect temperatures and consistent thermal wind conditions. Over summer temperatures range from 20-30+ degrees, so you can say goodbye to your wetsuit and hello to boardie’s and bikinis. We are so lucky to have a such safe, sandy beach and sailing area to ourselves, with cross shore reliable winds in an incredible sailing area – our Lixouri Bay Beach club opens its shack doors at 10 am and carries on through until the early evening to make the most of the best wind. 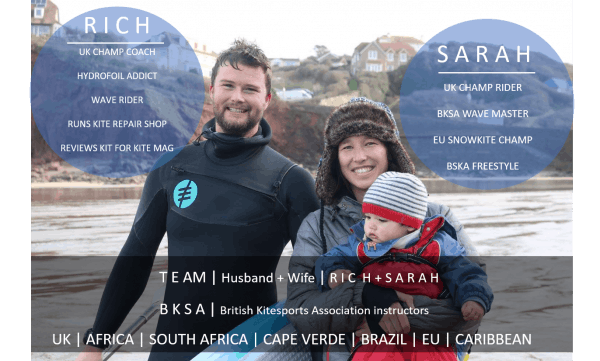 Husband and wife team, Rich and Sarah, have taught kitesurfing for over a decade. 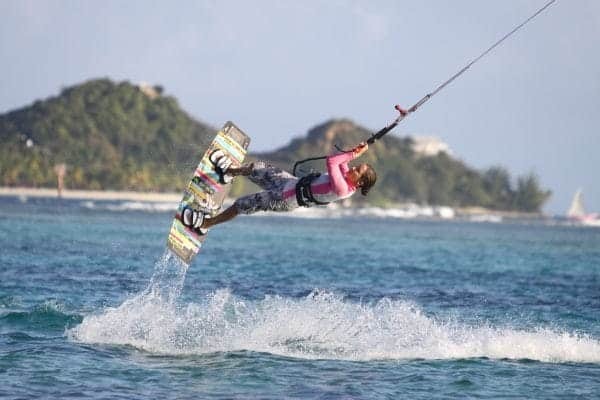 In fact, it’s how they met – on their instructors’ course with the British Kitesports Association (BKSA), the appointed National Governing Body for kitesurfing and other kitesports in the UK. Rich is an avid wave rider and hydrofoil addict. He has helped coach and nurture two UK champions in both the women’s and juniors fleet. He runs his own kite repair loft alongside kite retail and has been involved in R&D for kite manufacturers and reviewing equipment for a kite magazine. Sarah was the female UK wave champion in 2011 after winning the BKSA Wave masters, and has competed in the BKSA freestyle discipline and the European Snow kite Championship. She has also sat on the BKSA board. When not kitesurfing, working or busy being parents, they both enjoy skiing and snowboarding, wakeboarding, surfing and paddleboarding. Their lessons follow the internationally respected BKSA teaching scheme. This is designed to enable beginners to achieve a competent level of independence. Students will learn to fly the kite safely, launch, land, relaunch, retrieve and control the board, board start, and rescue themselves via a deep-water pack down. You will also learn to risk, and site assess the beach competently, rig and pack up, choose the correct equipment and location, avoid collision, and behave safely and responsibly as an independent kite surfer. Lessons will include all kite and safety equipment, and will be taught on Ozone kites, one of the most respected brands in the industry. During the week, you will learn how to become an independent kiteboarder while staying safe. By the end of the course you will be able to fly the kite on land, body drag, water start, ride a couple of meters on the board, self-rescue, recover your board and be completely independent flying the kite by your own. The course will be spread out over the week, making the most out of the wind conditions. During the week, you will progress with the skills you have learnt previously. By the end of the course, you will be able to feel super confident and ride comfortably. The course will be spread out over the week, making the most out of the wind conditions.